So today, my dear friend Cass informed me of a pretty serious jam that she and her family are in. (Details on her blog) And just as I'm visiting her ebay auctions, the movie that the boys were watching in the next room was ending and I heard this.. I thought it was quite ironic that this was what I heard as I pondered how I could help Cass. So not only can I reach in my wallet (err, paypal account) but I can put out a signal for others to go check out the yarn she has for sale or her ebay auctions. Look! I made actual YARN! Real, wool, plied, YARN! It certainly has its fat and thin spots, but, duuuuude.. I MADE YARN! Its blue colonial, from where else, The Spinning Bunny, just shy of 4oz, and is probably somewhere between worsted and bulky depending on where you look. I'm just tickled! But.. I do need practice. Plying on the wheel wasn't as easy as I assumed though. I think I need to see it done by someone. Besides fibery stuff.. we're all battling a bug here. Dylan started coughing yesterday. By last night Connor required one go round with his nebulizer, and I woke up this morning feeling like a coughing, congested train wreck. The good thing though is that this is a pretty short lived bug. Cassidy and Alex got rid of it pretty quickly, and Dylan is already feeling better. Connor seems to be the only one really struggling with it. Poor kid. His second birthday is Friday.. I really hope hes feeling better by then. Look who wrote his name for the first time! One of our quirky Martin family traditions is to take a snapshot of the kidlet with their first solo go at writing their name. It occured to me today that I haven't done a sockapaloooza update in quite some time! I know y'all are looking at those Kroy Retro Ribs, saying to yourself "so where did the beautiful blue badcauls go?" Well, I never could get back into the groove on those. I think it was the re-knitting that did me in. I got quite sick of that sock, and so wasn't enjoying the process. Now I've gone to my pal's blog a lot, read and re-read her preferences, and I think she'll like funky Retro Ribs much more than blue Badcauls. Perhaps I'm just trying to convince myself, thats always possible. But I've made my decision, and I'll stand by it! Loren and I had plans to get together on Saturday to wash and card fleece, spin, and visit over tea and scones, however Richard was stuck at the office most of the weekend, due to TelAuc 2006 (and Loren and I have already re-scheduled) Its the first year with the new online bidding software, so everyone was quite busy over there. For the peeps here in CNY, if you are a WCNY member, call and get your bidding number and consider going to bid this week on some fabulous items! If your not a member, you can still get a bidding number for a small fee. I won two fabulous auctions this weekend! A great gift package from Moosewood Restaurant (cookbooks, tote bag and coffee mug) and.. (drumroll) a nice size gift certificate for Mission Rose Quiltery (which is also a FABULOUS yarn store!) Seriously, there are some great deals up for auction, and a lot of service and merchandise certificates for things you already use and need (oil changes, yoga classes, music lessons, and skads of other things, so go check it out!) You can bid by watching WCNY and calling in, or once you have your bidding number, you can log in, and bid online. Its only day 4 of 10, so there are lots of great things left! Ok, enough of my non-paid endorsement for PBS and WCNY.. As you can see above, I finished the "Roses For You" targhee from The Spinning Bunny, and I am in love with it. It spun so differently than what it looks like in roving form. 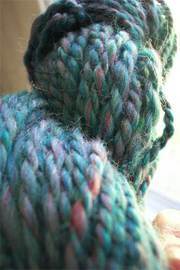 I thought I loved the colors of the roving, but I am in absolute awe of it spun! I need another 4oz though, so I can ply it with what is already spun. In hindsight, I should have split that 4oz. But this really is my first spinning attempts, and seriously, I need an excuse to buy more! My other wool orders arrived as well! Even more wool from Spinning Bunny, more hand dyed targhee in the "fruit salad" colorway, some superwash merino (socks!) brown corriedale, and blue colonial (there in the middle of the picture. That ball looks smaller because I started spinning some last night) And the rest is from an ebay seller, Blue Goose Glen,.. white, lime and peacock blue merino. Sooooooft stuff! I think I'm pretty set on spinning wool,.. at least for now! Now with all this said, I had some issues with my wheel last night. It occured to me that I never learned how to switch the ratios on the one flyer I have. Richard and I were able to figure it out easily enough, but I'm having a serious problem with the drive band. On one setting it works fine, but when I move the band to the other, its way too loose. I shortened my band, re-adjusted, to no avail. I think I need to have some more sit down time with Susan and my wheel, or some help from someone once I join the guild. I'll be fiddling with it again tonight for sure, but I think I need to purchase a back up drive band. Also this weekend, I got out to run some errands, and while out, picked up a dish cloth booklet for Krissy, who is visiting this coming weekend, and will be learning to knit! We'll be diving in my stash for some cotton, rooting out some needles and going over the basics. What better way to learn the basics, than make dish cloths! On the family front, the kids have spring fever badly. Which is difficult on a cold, damp rainy weekend. But at least its getting green outside (and my allergies are acting up!) We're trying to keep busy with indoor activities, but there is only so much you can do without going bonkers. Get here already warm weather! I've made a new category called "rant" because I need one. So I'm surfing through Huffington Post, this morning, where I usually catch news highlights for the day and happened along this story. Apparently this mom in Georgia wants the local school to ban Harry Potter, because of "witchcraft". “I’m a true example of how Harry Potter books can open your life to witchcraft,” said Jordan Susch. Susch says she read the first Harry Potter novel when she was in the fourth grade. Two years later, she says, she and her friends were practicing witchcraft. “We wanted to know if spells, potions and curses worked. By the seventh grade, I was so depressed, I set a date to kill myself,” Susch said. Susch has joined Laura Mallory’s fight to get the novels removed from the Gwinnett County Schools’ shelves. Methinks this kid would have been better off in phsychotherapy. Truly, with thoughts of suicide and all that, thats a way deeper problem. I wonder how many other children's books this kid thought were real? Goodness, my FOUR YEAR OLD knows that Harry Potter, and everything within its pages IS NOT REAL! How much do you wanna bet these parents have a law suit planned against Scholastic and or J.K. Rowling? In the words of John Stossel, "give me a break!" Now my domains are down too, and have been for the past hour. So no email at all. Goodness gracious. I hate technology. So yesterday evening, Richard scrambles into the house from the office, and sits down to get busy. A last minute project at work, has really kept him hopping at the office, and it was the final day. Since what he was doing, would go much faster on the PC at home (he has a mac in the office) he came home to work. About two hours into said work, from the living room where I sit knitting, I hear "SHIIIIT!" and "Carla, come here". Not your typical "blue screen of death" was sitting there. This was a blue screen we've never seen before. We tried restarting, with no avail. Neither of our two hardrives would boot, and before too long, it started beeping at us, saying keyboard failure. The assumption? A fried motherboard. If anyone has any other ideas, please tell. Granted we've had this pc for a few years, but new it had a near 4k pricetag (can you say fully loaded?) I'm hoping it IS the motherboard, and we can just replace that. We really cannot afford another 4k computer, not now, and not anytime soon. So anyway, Richard was rushing around at 10PM, just about to get dressed and head back to the office, when I suggested that possibly he could use one of the laptops we have here. Sure enough, yes he could. I was long asleep by the time he came to bed. Of all times for it to go kerplunk, right in the middle of his project scramble. Annnd, Someone is spoofing my domain (mylittletribe.com) and sending spam from it. I'm not even sure how to freaking fix that one. Its definitely a Calgon sort of day. On the left, that is alpaca/silk in "tamarack & spruce" and on the right, targhee in "roses for you". I love them both, but I truly adore the targhee colorway. YUM! This is a sickness you know. Beth welcomed me to the "dark side" already.. and she wasn't kidding. This is addictive! And I thought knitting was an expensive hobby! I really am going to need my own sheep pretty soon! I was raving to Beth in email about the targhee and alpaca/silk from Susan's Spinning Bunny, and commented that I was afraid to spin it before I had more practice. I couldn't take it anymore. I'm flat out of "practice wool", and the lovely colorful rovings from Susan kept talking to me from the basket they sat in on the mantel. "Spiiiiiinnnnn me", it kept saying "Loook at me fool, look at this color, feel my softness, spiiiiiin me!" What can I say? I've never been good at saying no. So tonight, right before dinner, I started prepping, and once the kids were in bed, I sat down and spun, not just a little, but a lot. I'm still not consistent though. Most of my "lumps" are from joining new strips of wool. More practice is needed apparently. I still love it though, and I'll still knit it with absolute pride. Connor cuteness for Tuesday.. Spaghetti for lunch!